Smudging is done to purify a place or a person and rid accumulated negativity, from jealousy, repeated failures or wickedness. 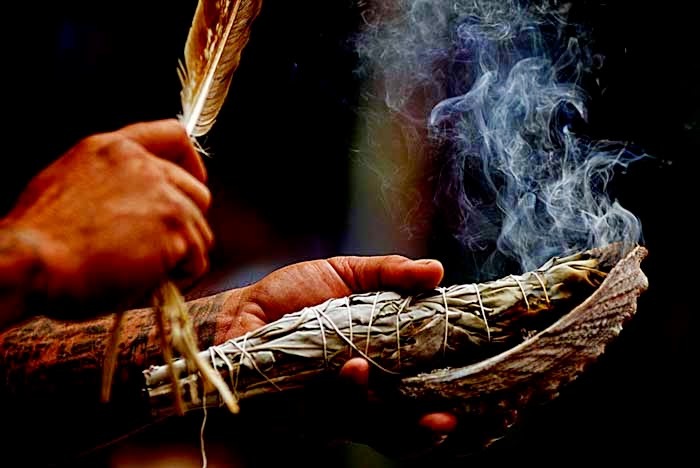 Smudging is an ancient ceremony from Shamanism and Hinduism. All civilizations have utilized water or incense for purifying because the human being which has a negatively charged "etheric body" is much more sensitive to bad exterior influences. Generally it is felt as fatigue, sadness, depression, inaccurate reflexes when facing life's sometimes difficult solicitations, anxiety and more portability to maladies. The ritual here beneath is very much similar to Inipi Indian ceremonies where ten people unite in a big tipi in which they heat stones upon which they pour water and sage. The smoke from the smudging surround their bodies ridding them from any negatively charged entities as well as effects from bad action, suffered or inflicted. It has been revealed to me that the date of birth of the person who undertakes the ceremony is very important. The incense and plant mix for the ceremony is chosen following the date of birth because of their different cosmic vibrations.